Only those lucky enough to reach 50 years together earn the privilege to answer such questions. Us mere mortals - their family and friends - are simply there to help celebrate. And our job is to provide ideas on how you can help mark this auspicious event. Watch their eyes light up when they receive any of these glorious golden gifts. Showcase a lifetime of love with a photo board featuring all the wonderful people in the happy couple's life. 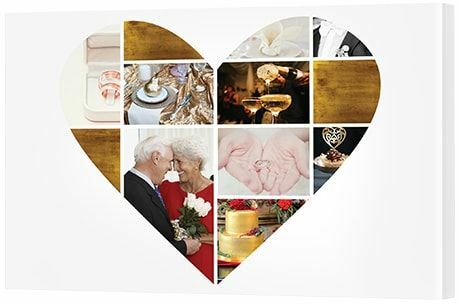 The perfect gift for the couple who has everything, this collage will make a wonderful party photo display and remain as a keepsake into the future. Work together as a family to collect the best of the best photos that present the couple together and with family. 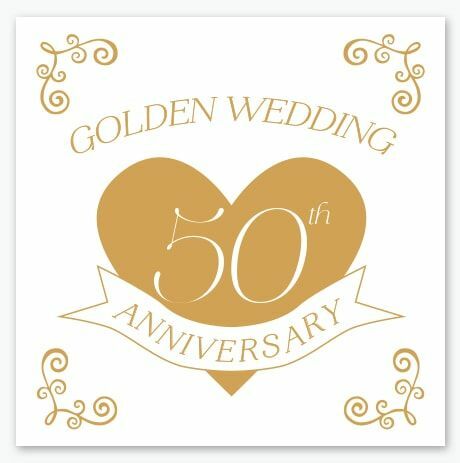 Use the centre panel to create a 'Happy 50th Anniversary' or 'Happy Golden Wedding Anniversary' in beautiful golden font. Alternatively use that centre frame for a hero photo of the couple. A 'hero' photo is one that stands out from the crowd - the best of the bunch. With photo boards like this, it can be tempting to include only couple photos, but a couple's life rarely if ever takes place in a bubble. This gift is about celebrating everything that makes this couple unique - family, fun times, travel. So get the family together to dig up photos from the past and the present. It'll be a great hit at their 50th party! Use beautiful brushed aluminium to transform an image into treasure with the click of a button. This metal anniversary plaque is bound to impress the golden couple. Find a graphic designer to create a high quality image or, if you have a good eye for visual design, create your own square image using Canva. You can choose any background you like. We've used white here in the example, but you can choose black, navy or maroon. The key is to make sure the gold coloured text is bright, bold and legible. While you can print this on any size metal print you like, if you want to create a 'plaque' effect, select the option 'Without wall mounts' as that way it will sit flush against the wall using adhesive tape. After 50 years together it's clear their love is infinite and as strong as day one of their marriage when they declared their eternal love for each other. That first exchange of the wedding rings, signifying never-ending love, is a wonderful symbol - a neat addition this circular collage. Don the rest of the glass frames with wedding photos from the couple's youth mixed with loving photos of the happy couple today. 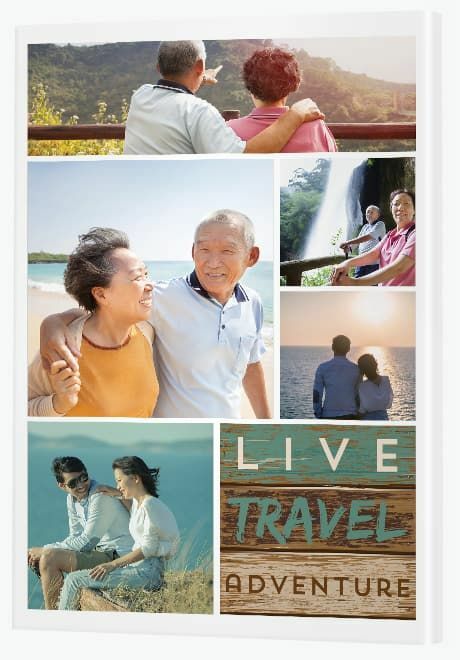 Celebrate their love of travel with a canvas print that will bring all the wonderful memories rushing back. When we put photos in albums, it can be so easy to pop them in a draw and forget about them. This gift is about bringing those memories to life again. If the extraordinary couple in your life is celebrating a 50 wedding anniversary, put together a bit of a plan that sees them sharing their travel photos with you. Not only will it spark many a conversation, but you can sneak away a few of their favourite photos. That said, it doesn't have to be a secret. Simply let them know you'd like to borrow a few photos for a project you're putting together and you'll return them shortly. Once you've collected the photos, scan them in at a high resolution, save them somewhere you can easily find them then upload them into our online collage builder. This themed travel colllage has a panel that says 'Live, Travel, Adventure' which is a nice touch. Alternatively, if you'd like to feature photos with no text at all, our traditional collage templates may be the go. All good things come to those who wait and this gift is designed to be given after the vow renewal. 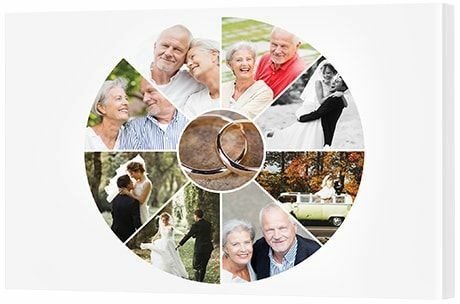 If the milestone couple is celebrating by renewing their vows with friends and family, take plenty of photos on the day then present them with this gorgeous gift from the heart. Golden wedding anniversaries make for wonderful photography including golden decorations and golden cakes. This silhouette heart template features plenty of frames for photos as well as arty images to intersperse. When can you shamelessly enjoy a bit of bling if it's not on your golden anniversary? 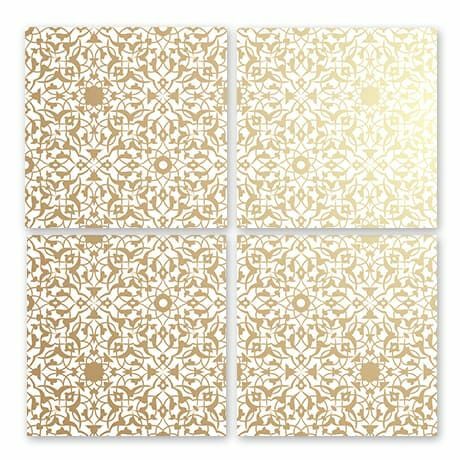 This glass gift, featuring a wall display of four gold images, will shine on and on like the golden couple's love. The wonderful thing about acrylic glass is it's long-lasting. The added bonus is it looks wonderful under light, with a lovely sheen. The wonderful thing about gold is it adds a special something to a home - a sense of luxury. This wall art print is definitely one for the lounge or bedroom, or any room that deserves some opulence. 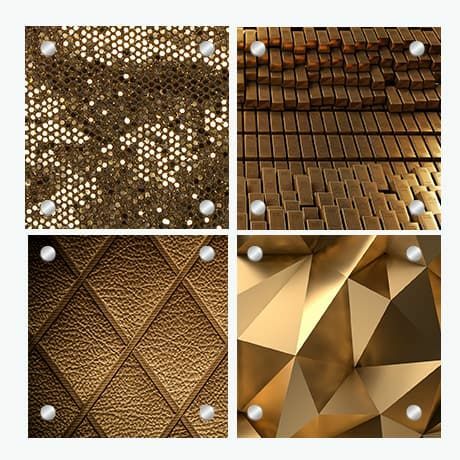 Just pick gold art images from our Canvas Art library, send us the links and we'll build this special gift for you. They say it's the little things in life that make one's life so special, so why not honour those things by way of a touching gift? Have a think about what the remarkable couple loves doing together. 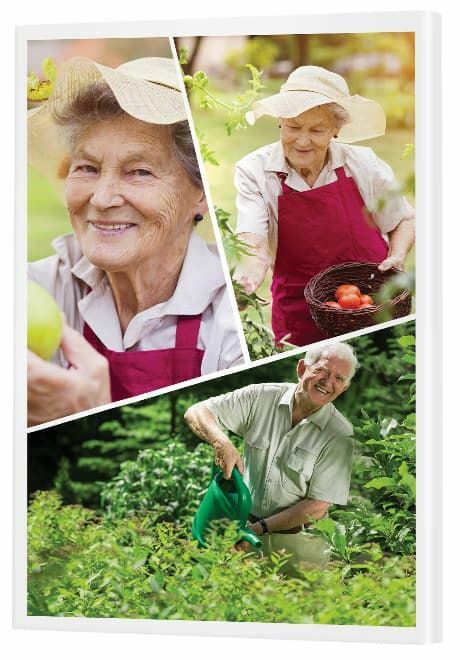 It could be a hobby or activity like gardening, cooking, bushwalking, bingo or playing bridge. Whatever it is, the idea is to display this shared passion on colourful canvas. As an extra special treat, you might even like to commission a professional photographer to arrange a photo series. The idea is that the photos are natural and portray an intimacy and joy that comes from the heart because they're both doing something they love. There's a comfort in that style of photography that the contrived conditions of a studio just cannnot match. It may take a bit of convincing and they'll probably think the whole thing is silly at the time, but it's also bound to be a lot of fun and the resulting photos and photo print at the end will make it all worth it. The good news is that photographers love stepping outside the studio today. In fact, they even welcome it - so there's no need to feel you're asking for something all that strange. When you reach 50 years of life and love together, it's evident that family is important to you - and worth celebrating. A spectacular wall display like this is a fantastic way to celebrate family. 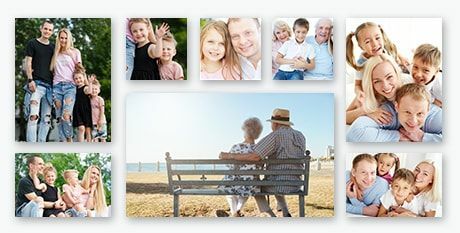 With eight frames to fill, make each one count featuring photos of their children and grandchildren. Give them the gift of family all over again, a visual treat they can enjoy each and every day. 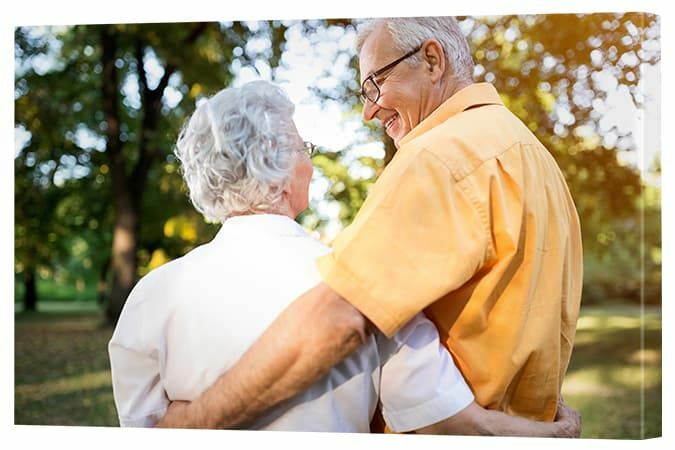 50th wedding anniversary gift ideas don't have to be as naff as a mug or a plate or a glass - they can be something a bit extra special. When we think of custom printing, we often think of photo prints but be sure not to forget the art option available. You could browse for hours in our Canvas Art library, getting overwhelmed at the 20 million options or you can simply plug in a search for 'gold'. Go to the Canvas Art menu button via the front page of our website and, to bring up the search bar, just click onto the menu item. If that, in itself, is still too overwhelming simply browse through the different types of artworks - Contemporary, Islamic, Egyption, Modern - and see if anything you'd like to gift comes up. 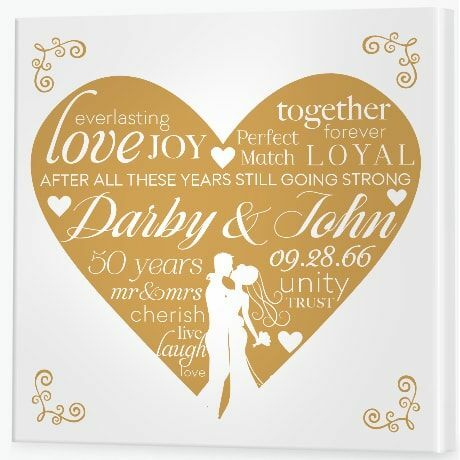 Why settle for a generic off the shelf tribute when you can customise words that perfectly fit the milestone couple? The brilliant thing about a gift like this is that it looks so precious, yet it's so affordable. The key is finding a friend or family member who will create the custom design for you. You could also try your hand at using Canva, but unless you have a good technical and visual eye, it's probably best to find a design expert to help get this image just right. Just show them this canvas image we've put together and ask them to recreate it with the name of the anniversary couple and the words you'd like to include. Lots of big golden love right here. 50th wedding anniversary gift ideas from the grandkids can be a whole lot of fun when you bring photos into the equation. The wonderful thing about this beautiful balloon gift is that it may look remarkable, but it's not going to break the bank. Our canvas collages are the same price as a single canvas print which means the kids get to have a whole lot of fun building a collage without anyone worrying about breaking the budget. 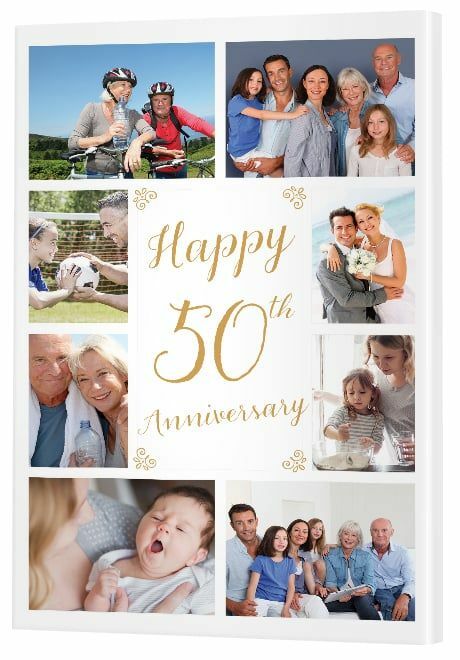 Collect photos of the 50th anniversary couple as well as photo of all their grandkids. 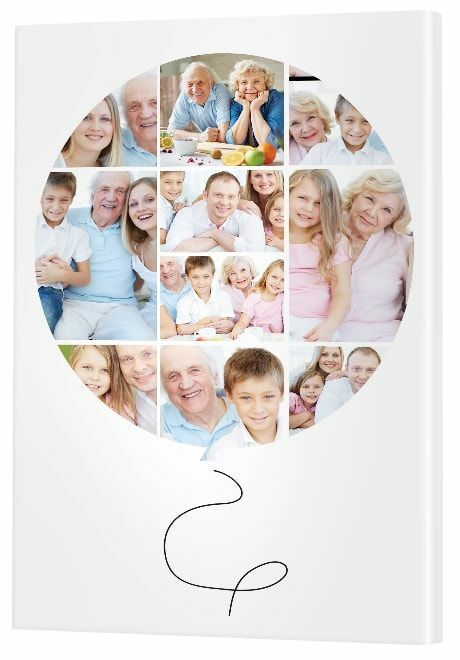 If they have a lot of grandchildren, the key is to not forget anyone! You know what kids are like! Get the kids together around a computer and let them choose which photos to put where. As always, they'll be wizzes with our collage maker, no doubt figuring out how to zoom in and move pictures around in no time. While this balloon collage template features an abundance of frames, these silhouette collages come in eight fun styles so be sure to have a browse through the templates to discover what's available. This example features a white background and borders, but you can choose any colour you like. Don't worry, the kids will figure out how to do it.